Suwanee, Ga. (February 11, 2014) – Rugged Ridge® today announced the availability of its new Gen II Swing and Lock Tire Carrier for the 2007-2014 Jeep® Wrangler JK, beginning April 1. Unlike previous designs, Rugged Ridge’s tire carrier maintains full mobility of the rear tailgate and eliminates the cumbersome two-stage opening process present in other designs. 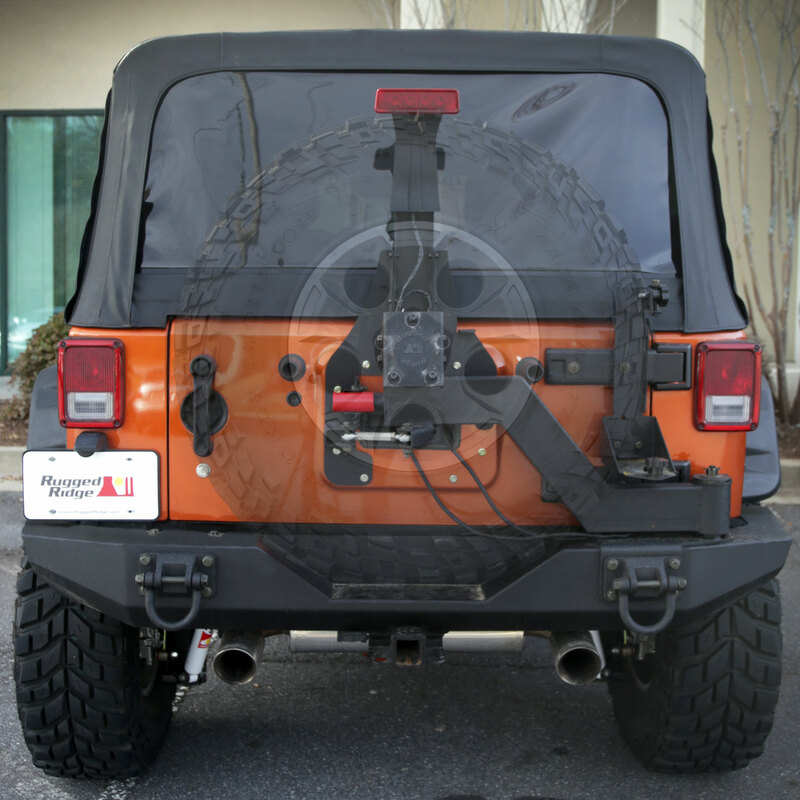 Using the factory latch mechanism and a reinforced spindle, Jeep owners have the ability to mount up to a 37-inch tire and operate both the carrier and tailgate simultaneously without any hassle. The Gen II Swing and Lock Tire Carrier also features an adjustable saddle that is fully compatible with Rugged Ridge’s existing line of XHD rear bumpers (P/N 11546.20 and 11547.01) that operate as easy add-on components, requiring no drilling whatsoever. Constructed of heavy-duty 3mm box-welded steel that’s finished in a durable black powdercoat matching Rugged Ridge’s original XHD Bumpers, the new tire carrier also features polyurethane bushings, meaning it will swing open smoother and with less vibration. The Gen II Swing and Lock Tire Carrier is also backed by Rugged Ridge’s 5-year limited warranty and retails for $499.99. For more information about the Gen II Swing and Lock Tire Carrier, Rugged Ridge’s complete line of high-quality Jeep and off-road products, or to find an approved retailer, please contact Rugged Ridge at (770) 614-6101 or visit its website atwww.RuggedRidge.com. Omix-ADA®, Inc. is the world’s largest independent manufacturer and wholesaler of Jeep®, truck and off-road parts, accessories and floor liners. For nearly two decades, Omix-ADA has designed, tested and manufactured more than 16,000 of the highest quality restoration and replacement parts and accessories. The Omix-ADA family of brands, Rugged Ridge® and Alloy USA®, are distributed throughout the USA and in more than 50 countries worldwide. For more information, please call Omix-ADA, headquartered in Suwanee, GA at 770-614-6101 or visit www.omix-ada.com.